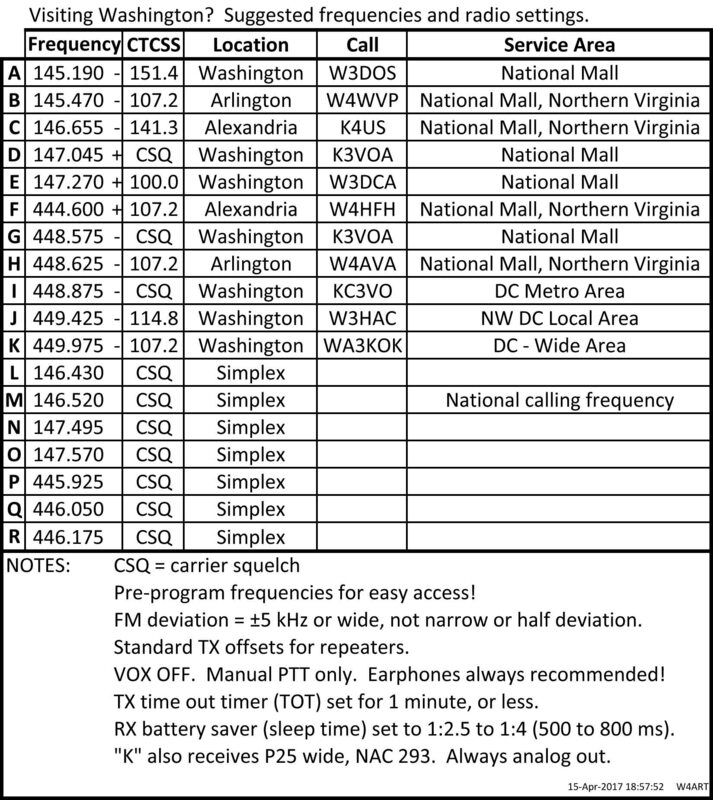 If you happen to be traveling to the DC area for any reason, we are providing the attached frequency list as a courtesy reference for hams who may be frequenting the popular tourist area of the National Mall and want to know what frequencies work in the area. 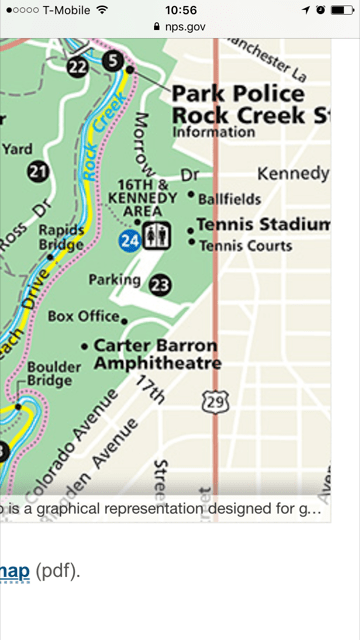 Our own club’s repeater (W3HAC) has only, “limited, unreliable coverage” on the National Mall, but is still useful for several areas of the city, including areas of popular hotel accommodations, in particular, in the North West quadrant of the city. Despite the other information you may see, including on our own website about access to our own repeater, the information on this list is the most up to date and accurate information available. We are aware that there is contradictory information, including tone and code information contained elsewhere on the site. This is due to old administrative permissions allowing post access to certain areas of the site that are still being changed over and addressed internally within the club. We are working to address and correct the situation and apologize for any confusion this may cause. All of these frequencies were field tested as of April 15, 2017 from the area from the National Mall and are accessible with a standard HT at 3 to 5 watts of output power, with the exception as noted above for our club’s W3HAC repeater. If you plan to operate in crowded pedestrian conditions, we recommend your use of headphones in order to maximize your ability to effectively copy traffic. We also recommend programming your transceiver with these frequencies in advance of potential operations in order maximize your effectiveness as an operator in the event of trying to operate in potentially crowded or stressful environments. Many thanks to Arthur Feller – W4ART, for creating this list and field testing the frequencies. The community owes Art a huge debt of gratitude for his service. Welcome to Washington, DC! We hope that you have a safe and enjoyable stay in the area. 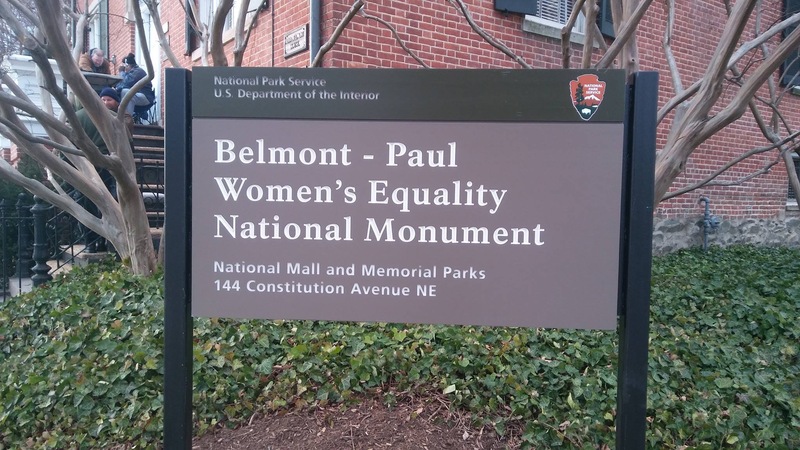 On 12-31-16, several members of the HacDC ARC activated the highly sought after “Sewell-Belmont House” in Washington, DC to finish off the ARRL’s year long “National Parks on the Air” (NPOTA) initiative. This initiative was run in tandem with the Centennial celebration of the National Park Service. 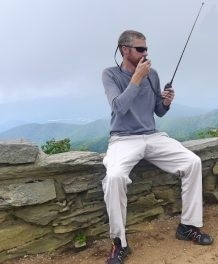 By encouraging use of amateur radio operations from and to these NPS facilities, the initiative helped promote the unique history of each park space and demonstrated the utility and diverse nature of the amateur radio service in these highly visible public settings. Thanks to all of those who attended and assisted in this and all of the club’s “NPOTA” activations throughout the year. Hello friends of HacDC and HARC. We are finally launching our first high altitude balloon in several years with callsigns W3HAC-11 & W3HAC-12 on ARPS 144.390@500mW and 433.500@1W respectively at 9am. W3HAC-12’s frequency may change the day of due to conditions which we will announce. There should be a digipeater on W3HAC-12 for the duration of the flight which should be between 2-2.5 hours. Feel free to track us at http://aprs.fi/#!call=w3hac-11 or directly yourself. We are flying 3 cameras, 3 sets of sensor packages with data to be recovered after landing, and an SD card “resiliency” experiment. We are launching from Strasburg, VA unless morning predictions cause us to go further south. The Spaceblimp team has been planning this since July so we hope you track us. Pictures, video, and data will be available a few days afterwards at http://wiki.hacdc.org/index.php/HacDC_Spaceblimp_6. Please join HacDC in a National Parks on the Air (NPOTA) activation…with a twist! Question: How do you activate the National Mall without stepping foot on the lawn? Answer: By activating a unit maintained by the National Mall park! You are invited to join the HacDC Amateur Radio Club (W3HAC) as we take amateur radio into the heart of the city! 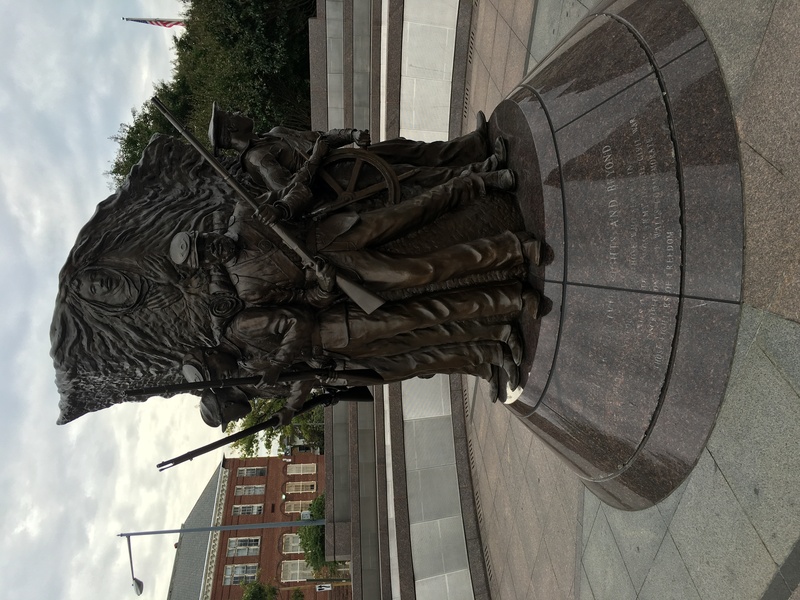 On October 15, 2016, following our club breakfast, we will attempt to activate the beautiful, but striking, African American Civil War Memorial at the intersections of 10th St., U St. and Vermont Ave. in N.W., Washington, DC (1925 Vermont Ave, N.W., Washington, DC 20001). We will be right near the top of the U Street/African-American Civil War Memorial/Cardozo Metro Station. Our approximate time of deployment will be between 1200-1300 EDT (1600-1700 UTC). We will have one station and band / modes for operation are expected to begin on 20M phone in the General portion of the band, with CW operation possible for all license classes to have an opportunity to work. Club members will self spot on popular sporting networks and encourage stations working us to continue to spot members as they QSY. Updates to FB will also be posted in kind for “W3HAC”. By working our W3HAC station, you will help us demonstrate the amateur radio service to a wonderfully diverse mixed use residential/business community with a rich history in our Nation’s Capital. As a “Chaser” you will get credit for working park DZ06 / National Mall. As an “Activator” operator, you will get practice working in a field environment and enjoy an opportunity to make numerous contacts with your fellow operators from a wide variety of areas on multiple bands. You will also learn how the ARRL uses Logbook of the World to efficiently and effectively track and validate not only the contacts made, but the number of parks activated during this year long NPOTA initiative. You will be able to see first hand why this initiative has been incredibly successful in helping the National Park Service celebrate their 100 year anniversary while helping the American Amateur Radio Relay League educate and inform the public about the value of the amateur radio service. Questions? Comments? Please just me know. My contact information follows the message.